This extension allows you to integrate WP Courseware plugin (by Fly Plugins) with the WP eMember plugin. So when a member purchase a membership level, he/she is automatically enrolled to the course you specify. 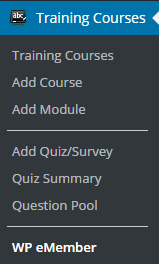 It can also do the retroactive course assignment (assign selected courses to members of a particular level). Configure the course access permission for each of the eMember membership level that you have. When members register/pay for a membership level, they will be automatically enrolled to the corresponding course for that level.